Made by Gottlieb in August, 1975. This is a single player 'wedge-head' replay version from late in Gottlieb's electromechanical era. This machine has been called 'the poor-man's Buckaroo'. The playfield and game rules are almost the same, even though the games are 10 years apart. Backglass: Race track with Formula 1-style cars racing around. Unlike Buckaroo, Spin Out has no backglass animation. Playfield: Symmetrical layout with a row of 5 lanes at the top. The center lane scores a special when lit. The others are labled A, B, C, and D. Getting A through D lanes lights the center lane for special. 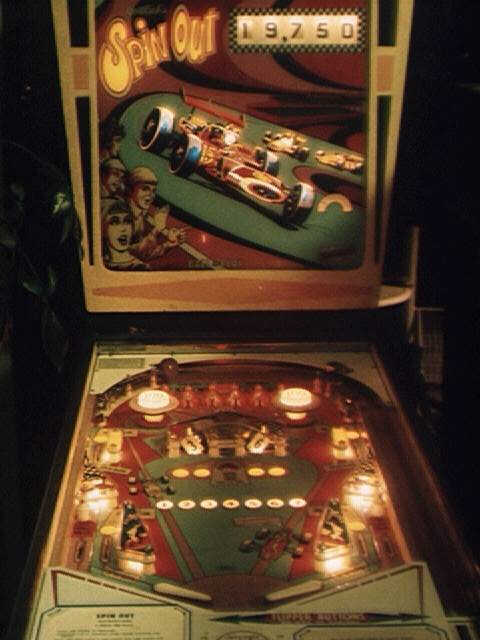 The prominent feature on this game is the roto-target in the center of the playfield. Cabinet: Colors are yellow and black on a white background. The stenciled shapes are Formula 1-style cars and a driver's head with a helmet. This machine has several items to shoot for. For each of the lettered lanes completed, the center eject hole and corresponding lit side lanes score an additional 1,000 points. So, completing all four lanes gives you 5,000 points for every time you hit the hole or a lane. This racks up the points very fast. A special is scored for each 4 consecutive numbers lit, from 1 to 7, from the roto-target. For example if you light 3, 4, 5, & 6 you would earn a credit. Note also that if you light 1, 2, 3, 5, 6, & 7 you score nothing! But if you then light the 4 you earn 4 credits. Obviously the 4 appears on the roto-target only once, whereas the other numbers appear multiple times. Not much can beat the excitement of hitting that 4 and getting 4 'thwacks' by the knocker coil. My only complaint about this game is, like many other Gottliebs, that there is no provision for earning an extra ball. I believe this would be a more fun game if it were an Add-a-Ball type. This is the second game that I bought from someone who was selling a newer game and keeping a relatively older (and much more beat) game. They were selling this one because it didn't work. This game did have some serious problems, but fortunately they were only wiring related. This is the game I keep at my In-Law's house. I tease my wife that this is to keep the peace.